Many jewelers offer a build your own engagement ring option featuring the use of semi mount rings. These partially set mountings let you create a look that’s all yours, often more quickly and for less money than a custom engagement ring. Build your own engagement ring or go custom made? What you need to know to build your own engagement ring? What are semi mount rings? How customizable are semi mount rings? Strictly speaking, a custom engagement ring is a one-of-a-kind creation made from scratch, a ring that has been custom designed and made to your specifications. 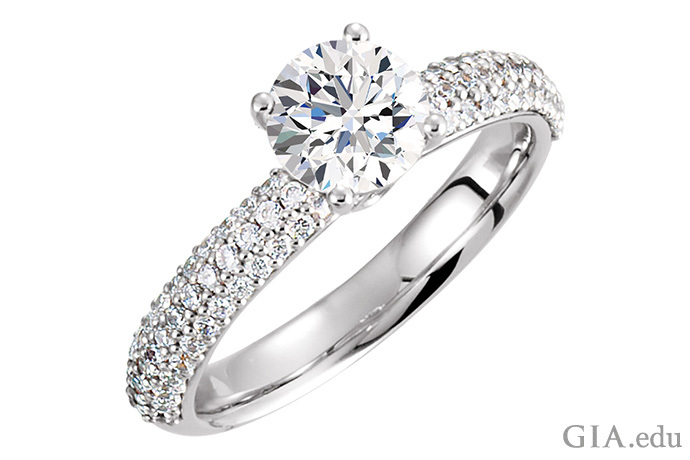 You can, however, customize your engagement ring by choosing from existing components. You get to build your own engagement ring by selecting your diamond and choosing how it will be set. You select the style of the ring, the metal it’s made of and other elements from a fixed menu of options. All things being equal, these types of engagement rings are significantly less expensive than custom engagement rings, while still delivering a distinctive look. And because the components are ready-made, you save on the time and labor that goes into designing a custom engagement ring. If you opt to build your own engagement ring, there are some limitations you should know about. Because you’re choosing from prefabricated components, you cannot change their design or structure. In addition, some styles of ready-made settings may limit the size, shape and cut of the center stone you choose. However, with so many options available to you – and a little research – you should have no problem building a beautiful engagement ring that reflects your love. You’ll have to make a number of choices when you select the parts to build your own engagement ring. Typically, a jeweler will begin by asking questions to get a better idea of the style you’re looking for and your budget, which will narrow things down. It helps to do a little research beforehand. Browse online or in stores to get a sense of the many engagement ring designs. Of course, knowing your fiancée’s taste is also important. If you’re not sure, start paying attention to the jewelry she wears and her reactions to friends’ or celebrity engagement rings. Does she prefer gold or platinum? What diamond shape does she want: Round, square, oval or something else? Are you considering a diamond solitaire, or would you like to add side stones? What’s your overall goal: The diamond with the most sparkle? The largest diamond you can afford? Do you want an inscription? You can have your wedding date or a romantic saying like “I love you” or “Forever yours” inscribed on the inside of the band. When you build your own engagement ring, you’ll be able to mix and match settings with different diamond shapes. This includes picking the metal (yellow gold, rose gold, white gold or platinum) and choosing a style for the mounting (contemporary or classic, with or without diamond melee, etc.). 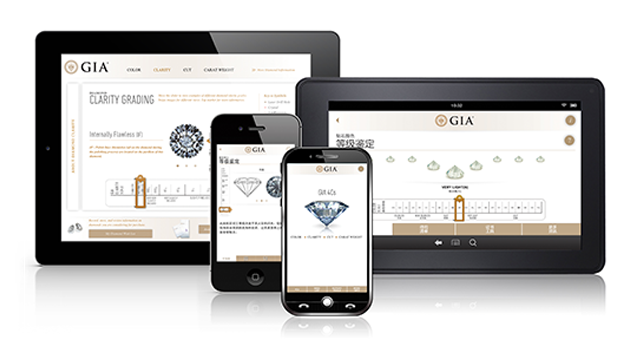 Your jeweler might show you samples in the store, a catalog from a manufacturer that makes different kinds of mountings, or a manufacturer’s website. You’ll get to pick the components you like. Some jewelers have a large inventory of semi mounts and diamonds in stock; others may have to order from a vendor (this is easy to do, and components may arrive in as fast as two days). Once the parts are available, a bench jeweler will assemble the ring. The store may have a bench jeweler on staff or contract the work out. A mounting refers to a prefabricated ring that is ready for the stones to be set. 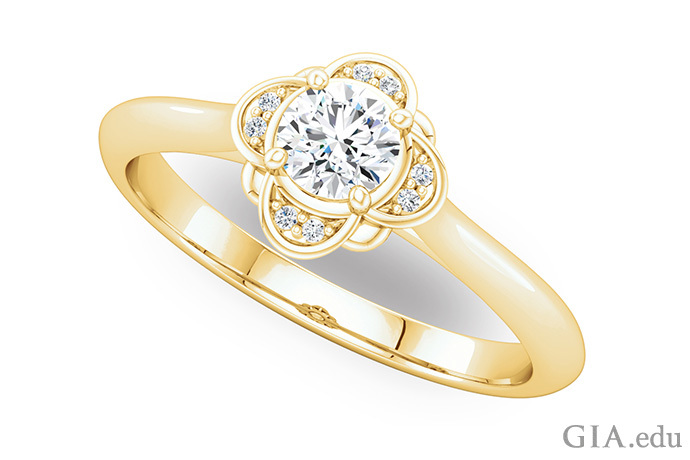 The overall design of the ring might include a head for the center stone, heads for side stones, or areas to channel set, bead set or pavé set diamonds. Semi mount rings (also called semi set rings) are mountings that are already partially set with melee or baguette diamonds or colored gemstones. They contain all of the gems, except for the center stone – which you get to choose. 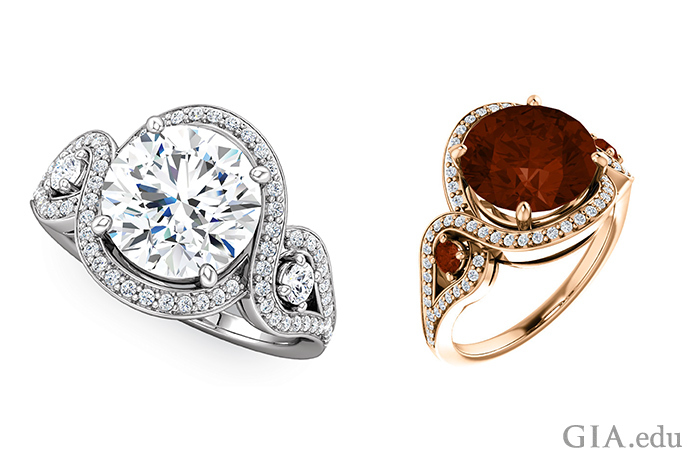 You can choose diamonds for a 14K white gold semi mount ring or add a splash of color with garnets in a 14K rose gold semi mount ring Which would you choose? Courtesy: Stuller, Inc.
That depends on the semi mount. Some semi mount rings are cast as a single piece, limiting the size and shape of your center stone. Other semi mount rings may offer the option of interchangeable heads – the part of the mounting that actually holds the center diamond in place – giving you more flexibility in choosing contrasting metals and/or diamonds in different shapes and sizes. TIP: If you want to build your own engagement ring with an eye toward changing out the diamond at a later date, semi mount rings with interchangeable heads are the way to go. A real advantage of semi mounts is that they are already preset with diamond melee. This gives you a much better idea of what the finished ring will look like. Most semi mounts will indicate the range of color and clarity for the melee diamonds, and often the semi mount can be ordered with melee that closely matches the quality characteristics of your center diamond. Mounting: A mounting (or setting) is the metal framework that forms the complete ring. It includes the shank and any heads, channels or other metal components used to set melee. The terms mounting and setting are often used interchangeably in the trade. Shank: The shank is the circular part of a ring that slips around the finger. You might hear it referred to as the band. Head: This is the part of the mounting that holds the center diamond in place. The head might have prongs or be a bezel. The metal for the head can be the same as the mounting, or you can choose a different color to create contrast. The head is often interchangeable (i.e., a peg-style head). The shape and cutting style of the stone being set in the mounting determines the type of head that is used. Prongs: A prong is a narrow metal support, usually used in groups of four or six, to hold a gemstone in its mounting. A six-prong setting offers more protection than a four-prong setting should a prong break. Conversely, a four-prong diamond means less metal on the stone, which can make the diamond visually more impressive. There’s a lot more to consider, and you can learn about the pros and cons in How to Decide: Four Prongs versus Six Prongs for Your Engagement Ring. Bezel: This setting style features a thin metal strip that is pushed or hammered around a gem to hold it in place. A bezel protects the edge of the stone from bangs and bumps, but it can also reduce brightness. 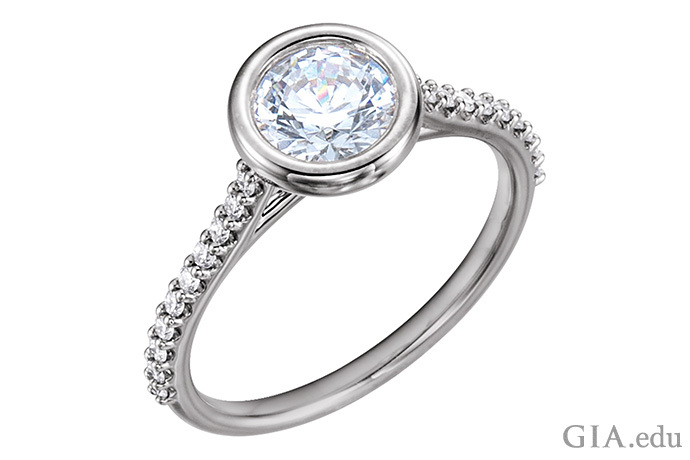 A 14K white gold bezel protects the center stone. It’s an excellent choice for individuals who are physically active. This bezel is made for a round diamond. If you wanted a diamond of a different shape, the jeweler would order the setting with a bezel to match that stone. Courtesy: Stuller, Inc.
Channel setting: For a channel setting, gemstones of the same size are set edge to edge, with no metal between them, against two parallel metal walls. This setting style is often used for diamond melee. 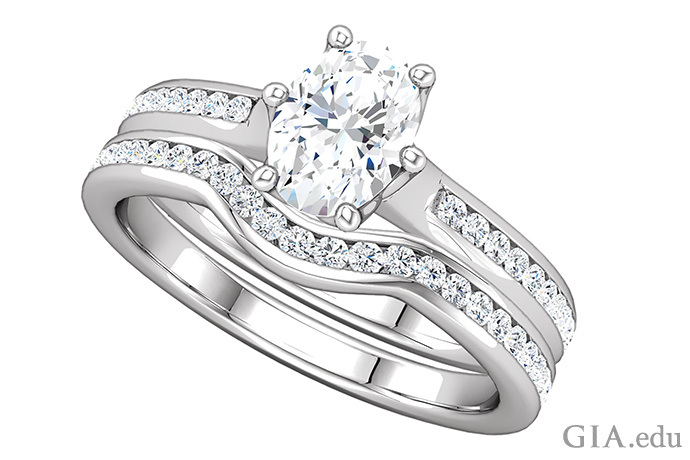 Channel set diamond melee decorate the shank of this diamond engagement ring and the matching wedding band. 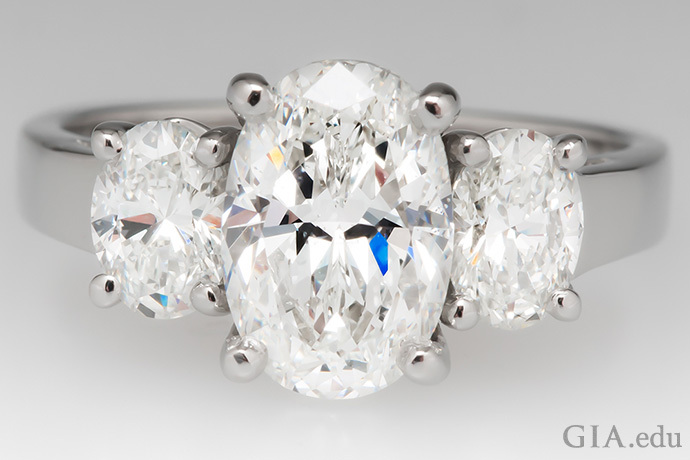 Six prongs hold the center diamond securely in place. Courtesy: Stuller, Inc.
Bead setting: For this style, diamonds or other gemstones are set in small holes drilled into the metal. The surrounding metal is then pushed up to form beads that hold the gems in place. 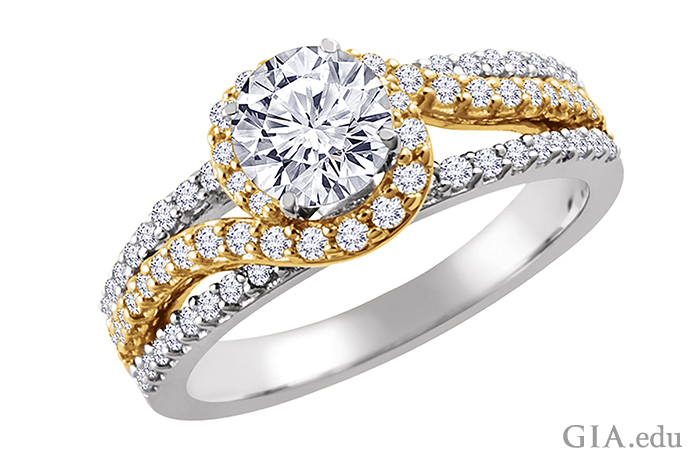 It’s easy to see the smaller diamonds are bead set in place in this 14K yellow gold semi mount engagement ring. 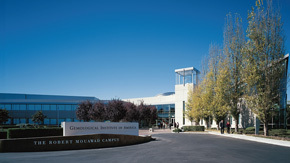 The oval center stone was added later on to complete the look. Courtesy: Stuller, Inc.
Pavé setting: Pavé is a style of bead setting where small diamonds are placed close together in a honeycomb pattern. Like bead setting, the diamonds are set in small holes drilled into the metal and held in place by tiny metal beads. The result is a field of diamonds with uninterrupted brilliance. 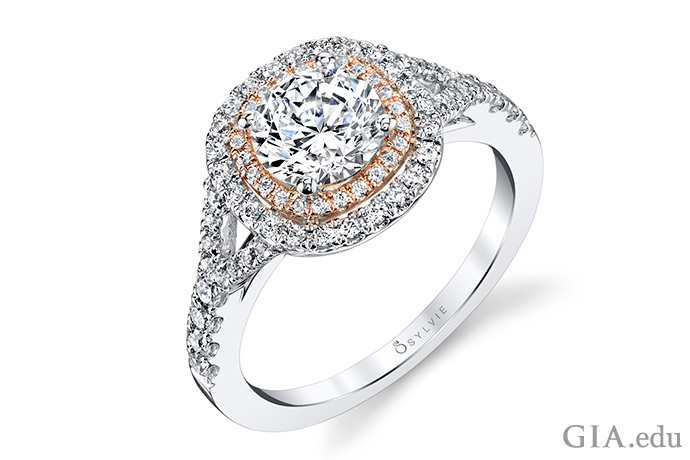 Diamond pavé in a mounting can add brilliance to an engagement ring. 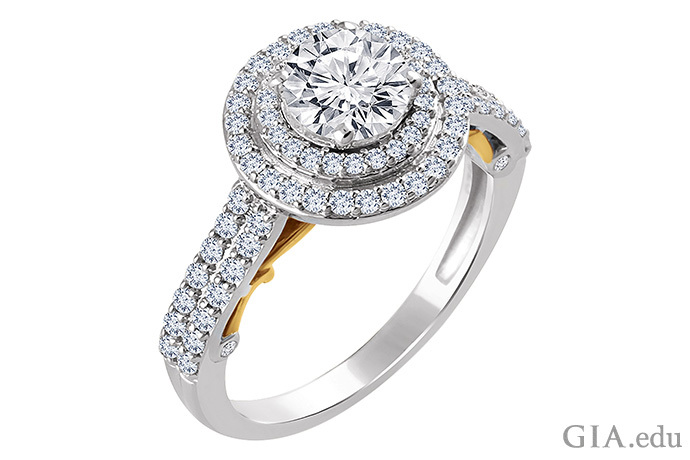 Courtesy: Stuller, Inc.
Halo: This design style typically features numerous tiny diamonds encircling the center stone. The diamonds are often bead set or channel set. Halos are extremely popular, as they add sparkle and can make the center diamond look larger. Halos have been a go-to design style for the past several years. So have split-shank engagement rings (where the band separates on either side of the main stone). 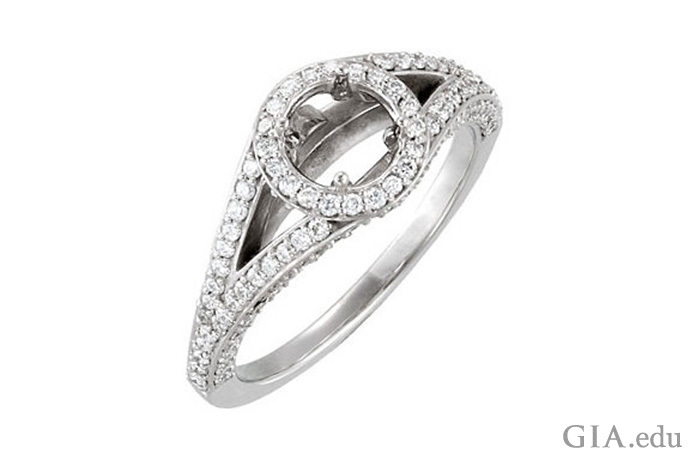 This semi mount ring has both – and it’s studded with 0.75 carats of diamond melee. Courtesy: Stuller, Inc. The diamond has become the universal symbol of love. Since it holds this rarefied status, it’s natural to want to build your own engagement ring with lots of diamonds. Using a diamond center stone, side stones and melee ensures that special sparkle in an engagement ring. Diamond center stone: The center stone is the star of the show, so you’ll want to choose the best diamond for your budget. Not sure where to begin? Decide on a shape. Round diamonds are the most popular for engagement rings. 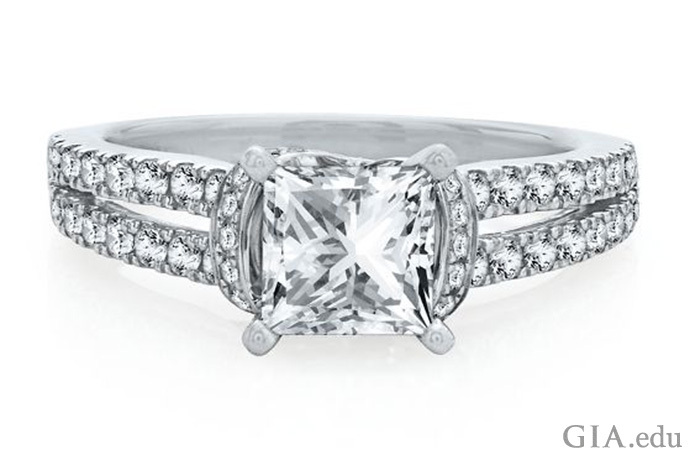 Square diamonds – most often seen in the princess cut – are popular, too. There are also ovals, rectangles, marquise and heart shapes, among others – each shape has its advantages for defining a special look or style. Not sure which diamond shape to pick? Our Guide to Diamond Shapes will help. If you want a diamond that sparkles, select one with a brilliant faceting pattern. In this gem cutting style, which is applied to a variety of shapes, triangular and kite-shaped facets radiate from the center of the diamond toward the girdle. The popular round brilliant cut diamond has 57 to 58 facets, depending on whether the culet is faceted. Regardless of the diamond shape and cut you choose, be sure to familiarize yourself with the 4Cs of diamond quality: Color, Clarity, Cut and Carat Weight. If you’re trying to prioritize these characteristics, read What’s the Most Important C? Once you know the essentials, you can select the diamond(s) most appropriate to build your own engagement ring. 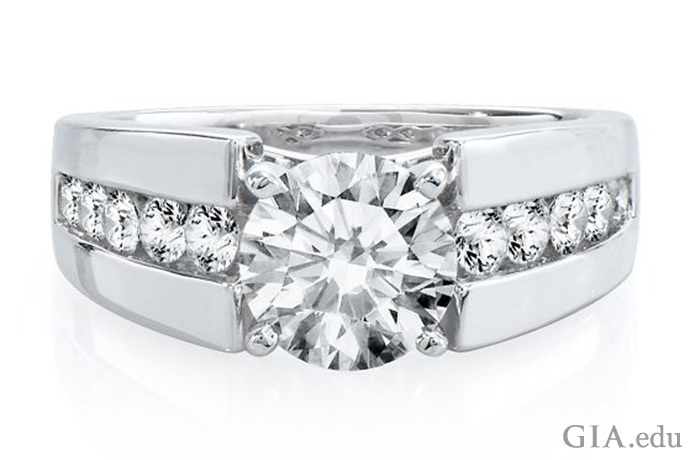 Diamond side stones: Side stones play a supporting but important role in engagement rings. They flank the center stone, adding sparkle to the ring. Choose from diamonds in any shape and size. Baguettes are often used as side stones. These are small, usually rectangular, step-cut diamonds with straight or tapered edges. Some baguettes are almost square, while others have a length-to-width ratio of 5:1 or even longer. A three-stone engagement ring is a classic look that is trending, thanks to the engagement ring that Prince Harry gave to Meghan Markle, now Duchess of Sussex. Melee: Adding diamond melee is a sure way to add lots of sparkle to a diamond engagement ring. These diamonds can be as small as 0.001 carats (1/1000 of a carat) and are often cut as tiny round brilliant cuts that are set around a center stone or along the band. Melee diamonds are an integral part of a semi mount. They are commonly used to make halos to accent a center diamond. Melee can be channel, bead or pavé set. 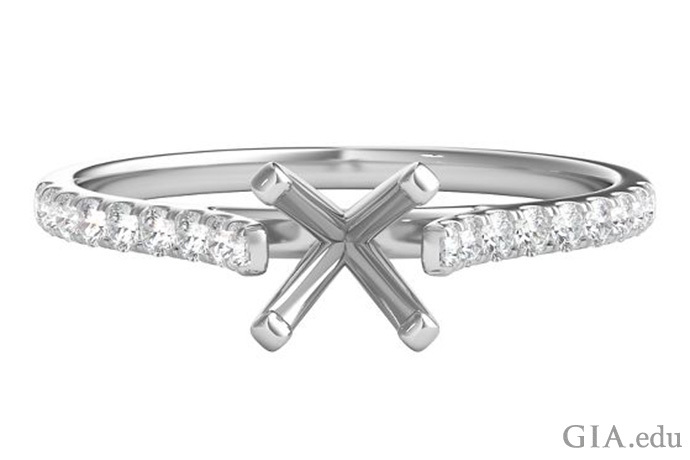 Melee can also be studded into the shank and even the prongs, making for an arresting, sparkling look. The semi mount you select reflects your choice of the setting style for the melee in your ring. Some 0.60 carats of diamond melee decorate the 14K white and yellow gold shank and double halo of this ring. The semi mount includes all the melee diamonds. The customer chooses the center stone. Courtesy: Stuller, Inc. Colored gemstones: If you’re looking for another way to enhance your diamond engagement ring, think colored gems. Sapphire and ruby are two classic choices. Cherished for millennia, these gems can play a starring role as a center stone, or serve as a beautiful complement to a diamond in side stones or melee. They are also a 9 on the Mohs scale of hardness, so are durable enough for everyday wear. 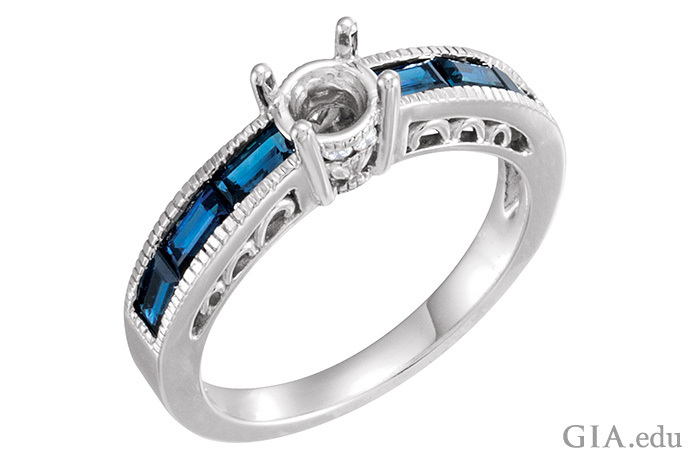 Six sapphire side stones enliven this engagement ring semi mount. Courtesy: Stuller, Inc.
You have lots of additional choices when it comes to using a colored gem as the center stone in an engagement ring: morganite, garnet, spinel and more. Any of these would bring a distinctive look to a diamond semi mount. Our Buying Guide: Colored Gemstone Engagement Rings will help you decide which colored stone is best for you. Yellow gold, rose gold, white gold and platinum are the metals of choice for semi mount rings. They’re beautiful and durable – ideal qualities for a ring meant for a lifetime of wear. Each metal offers a different look. White metals are perfect for a sleek, modern aesthetic. Yellow gold is a traditional choice. 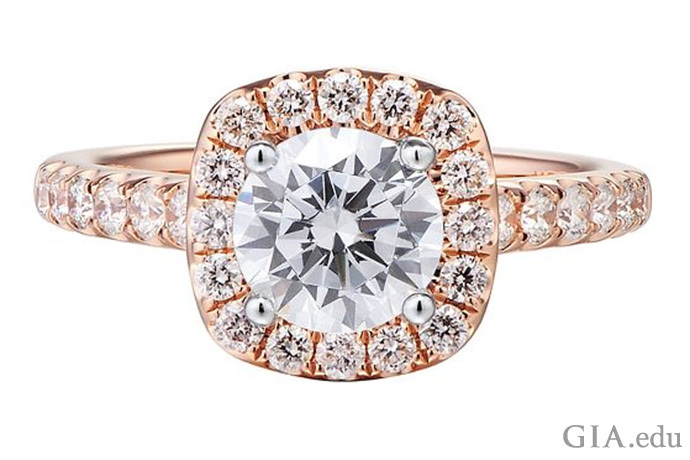 Rose gold conjures romance and is trending. Different metals were also popular during different eras, like platinum in the Art Deco era and rose gold in the Retro era. You can use them to evoke a style or a period in time. 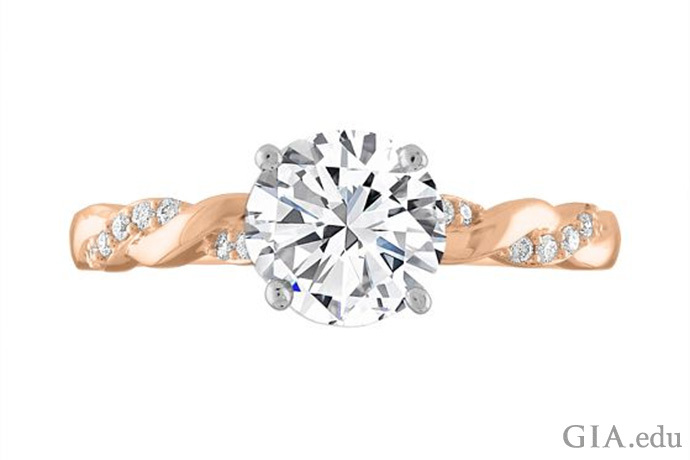 This 14K rose gold engagement ring began its life as a semi mount. It was made to fit a pear shaped center stone and it came pre-set with 0.33 carats of diamond melee in the halo and along the band. The semi mount can be ordered in different metal colors to accommodate diamonds of various shapes and sizes. 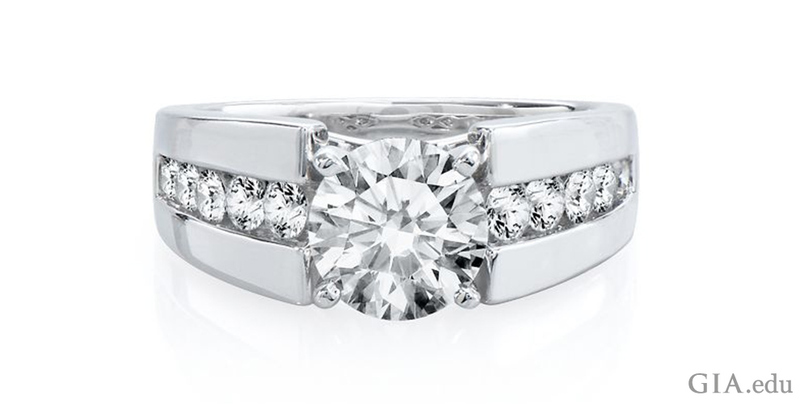 Courtesy: Stuller, Inc.
Mixing metals is in vogue – like having a yellow gold band with white gold prongs. Jewelers might also recommend different colored prongs based on the color of the diamond or gemstone. For example, if selecting a diamond in the D-to-J color range, white prongs will enhance its lack of color. 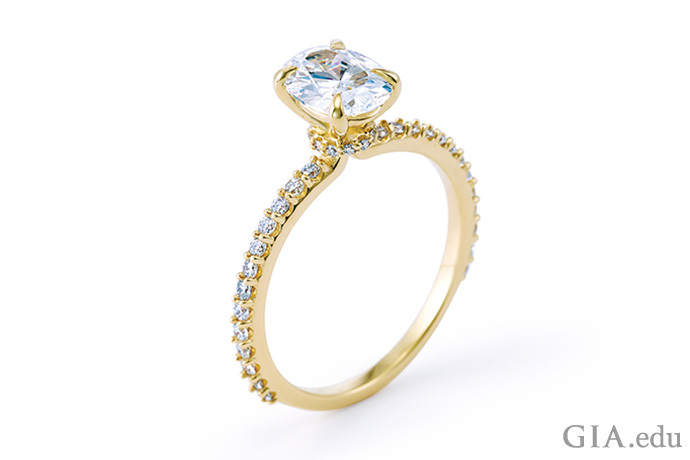 If the stone is in the M-to-Z color range, yellow prongs will accent the slight yellow in the diamond. The goal is to best highlight the beauty of the diamond or gemstone. Here’s a handy guide to picking the right color gold for your engagement ring. This 14K yellow and white gold semi mount ring, features a round brilliant cut diamond set with diamond melee in the halo and shank. Courtesy: Stuller, Inc.
As you go through the steps of building your own engagement ring, you’ll find that semi mounts offer lots of options. That’s the good news. The bad news: You have a lot of options! So how do you choose? It helps to have a particular style in mind. 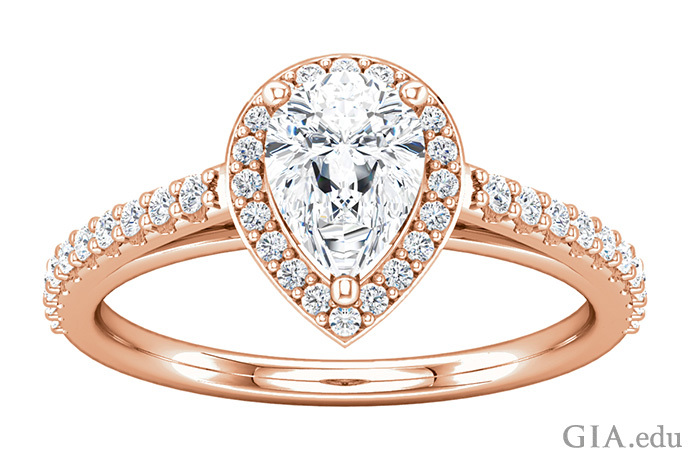 If you’re searching for inspiration, you can start by looking at engagement rings from the Victorian, Art Nouveau, Edwardian, Art Deco and Retro eras. Distinct motifs, popular diamond shapes and other characteristics mark each period. You’ll find many semi mount rings featuring engravings, filigree and other embellishments that suggest a particular historical period. Choosing one of these themes is a sure way to add personality and flair to your engagement ring. The center stone in this contemporary ring could easily be replaced with a different shape or size of diamond, or even a colored gemstone. Using the simple but elegant semi mount, you can customize the engagement ring based on your taste and budget. Courtesy: Stuller, Inc. If you want a more contemporary setting, page through some of the bridal magazines, look at the online offerings or, better yet, spend some time in a jewelry store familiarizing yourself with the many options available for semi mount rings. Ready to build your own engagement ring? Or maybe you’re looking for more inspiration? Our blog Engagement Ring Styles: Seven Irresistible Trends has even more ideas for creating an engagement ring that’s uniquely beautiful and hers alone.